The first of likely several great games in Class 6A, District 8, arguably the best district in the state, features Hutchinson at unbeaten Garden City. While 6A is known for high-flying offense this season, Garden City and Hutchinson are two of the better defenses on the western side of the state in the classification. Garden City stands sixth in the classification with 76 points, Hutchinson ranks ninth with 98 points. They are two of the top-8 defense in points allowed in the classification. The Buffs’ defense and special teams has yielded marked improvement from a 4-5 season in 2014. Garden City has allowed just 187 yards per contest, nearly 200 yards fewer than last season. Senior linebacker Nalen Rincones, junior linebacker Zeke Herrera and sophomore lineman Demarcus Elliott pace the defense. The offense, led by the school’s career rushing leader Jared Koster, has averaged 318 rushing yards a contest. Hutchinson has won every game by at least 19 points and has played a stronger strength of schedule (SOS) than Garden City. Hutch’s SOS stands No. 17, while Garden City’s SOS is No. 28 in the 32-team classification. Garden City averages 37.7 points per game, and Hutchinson averages 35.7. The Salthawks’ lone loss came in a 49-14 road loss to Derby in Week 4. Hutchinson is very run-heavy as well behind its big offensive line with seniors Austin Fletcher and Josh Rivas. Canyon Maldonado and Wyatt Atkins have both played quarterback, and the Salthawks have used multiple running backs, including Ruben Benitez, Tracy Harris and Trey Richards. Hutchinson has averaged 499 total yards in the last two weeks but been offensively inefficient with just 61 points because of penalties and mistakes. A key part to watch could be early on as Garden City has been prone to slow starts. Last week, the Buffs were down 7-0 against struggling Wichita East before exploding for 55 points. Hutchinson is 7-1 in the last eight meetings versus Garden City, but the only loss came against GC’s best team in the first five years of the Brian Hill era. The Buffs saved their 2013 season with a 35-24, district win versus the Salthawks, then won four consecutive games to advance to the 6A semifinals. This year’s squad could be Hill’s best squad. Garden City gets a slight advantage with playing at home and features the better defense and special teams. Two teams that are very similar square off in a key 4A-I district contest. Topeka Hayden, playing mainly bigger schools in the Centennial League, has outscored teams 223-106 with the No. 19 strength of schedule (SOS) in the classification. Andover Central has a 221-143 total margin with the No. 8 SOS, according to preppowerindex.com. The squads rank fourth and fifth, respectively, in 4A-I in scoring offense. Andover Central, 6-5 last season, has only lost to Maize South, 51-41. Peyton Huslig has passed for 968 yards with a 12 to 3 touchdown to interception ratio, and Darraja Parnell has 28 catches for 785 yards and 11 scores. Junior Isaac Anthemides is also a big play threat with 13 catches for 395 yards for four scores. The Jaguars rank fourth in Kansas with 242.5 passing yards per game, and in the top-5 in yards per reception (24.7). Central averages 55 snaps and 382 yards a contest and 7.0 yards per play. Huslig was out for part of the year with injury, and Cole Taylor filled in passing for 470 yards and six scores. Jordan Birch, one of the state’s fastest players and a state-champion hurdler, has 744 yards and seven touchdowns on the ground. Thomas Graham was second on the squad with 68 tackles, but was recently lost for the year with an injury. Dakota Rodd leads the team with 72 tackles. Hayden fell 26-14 at Washburn Rural in Week 2, and collected a quality 21-14 victory versus Manhattan the following week. Quarterback Dallas Crittenden has thrown for 872 yards and eight scores. Connor Schumacher is a multi-purpose threat with 416 rushing yards and 257 receiving yards. Hayden, more run-heavy with 247 rushing yards a contest, has averaged 61.7 snaps and 391 yards a game for 6.3 yards per play. Hayden won this matchup last season, 51-21, and collected a 21-20 victory in the 2008 postseason. Central has captured six straight regular season home victories and has the ability to create big plays with its bevy of weapons. The Jags do enough in the passing game for a high-scoring win. In a very top-heavy Class 4A, Division II, this District 1 race includes four teams each worthy of a playoff appearance. However, only two teams will reach the postseason. Perry-Lecompton visits Royal Valley in a game that will also help determine the Big 7 Conference title. Both the Kaws and the Panthers are unbeaten in the Big 7, and have a chance to share the title with Nemaha Central. Perry-Lecompton has overcome a pair of close losses to open the season by winning four straight games. The Kaws fell 32-28 to Tonganoxie in Week 1, and 39-38 in overtime to Silver Lake in Week 2. Since then, the Kaws have solid wins over Baldwin (26-20), Riverside (33-0), and Sabetha (28-14). Mitchell Bond made the move to quarterback from receiver last fall and has been productive. Bond has passed for 1,205 yards and 11 scores, and rushed for 421 yards and seven touchdowns. He replace Emporia State signee Seth Surface who produced more than 2,100 yards of total offense and 24 touchdowns last fall. Cole Kellum is Perry-Lecompton’s leading rusher with 578 yards and seven touchdowns. Senior Nate Bays already has 27 receptions for 516 yards and six scores. Aaron Chenall has contributed 22 catches for 303 yards and two scores, while Isaiah Dark has 16 catches for 210 yards and two touchdowns. Royal Valley has won five straight games after a Week 1 loss to Abilene. The Cowboys, still unbeaten on the season, defeated the Panthers 34-13. The Panthers entered the 2015 with nine starters on each side of the ball. Royal Valley finished just 2-7 in Jake Lott’s first season as coach, but has now reached five wins for the first time since 2011. Royal Valley has not reached the playoffs since 2005. Senior Zack Lux is a three- year starter at quarterback, while Derrick Barger is enjoying a huge season in the backfield. Barger has rushed for 1,116 yards through the Panthers’ first six games. He led the team with 653 yards last season. Last season, Perry-Lecompton won this match-up 52-13. The teams are much more evenly matched this season. Comparing common opponents, both teams handled Hiawatha while the Kaws bested Riverside by 33 points and Sabetha by 14. Royal Valley beat Riverside by 15 and Sabetha by eight. The two favorites in Class 2-1A District 4, Lyndon will travel to Olpe on Friday night. Last season, the Eagles beat Lyndon 36-28 to snap a three game winning streak by the Tigers in this series. Lyndon won 27-25 in 2013, 40-6 in 2012, and 20-9 in 2011. After opening the season with consecutive losses, the defending 2-1A champion Eagles have won four straight. Ryker Schmidt has stepped into the quarterback role to try and replace Bo Krueger and he has performed well. He has plenty of weapons around him in backs Andrew Burenheide, Dylan Redeker, and receiver Brady Scheidegger. Schmidt has thrown for more than 700 yards on the season. He connected with Scheidegger for a 34-yard touchdown pass in last week’s 40-6 win over Oswego; one of two Schmidt scoring passes on the night. Scheidegger has more than 350 receiving yards this season. Burenheide entered last week’s game with more than 350 yards rushing and added a pair of touchdowns last Friday. Lyndon also had the challenge of replacing an all-state player in quarterback Dawson Swinehart. Swinehart rushed for 1,858 yards, 30 touchdowns, and passed for 734 yards and six more scores last season. Junior Rylan Burns has stepped in at quarterback and completed an impressive 63 percent of his pass attempts. Burns has thrown for 548 yards and three touchdowns with four interceptions. Burns isn’t quite the running threat that Swinehart was last season, but has rushed for three touchdowns. Swinehart’s younger brother Dexton is the Tigers’ leading rusher this season as a sophomore. He has rushed for 430 yards and seven scores and caught 32 passes for 334 yards and two more touchdowns. Wyatt Fitch has added 362 yards and three scores for the Tigers. 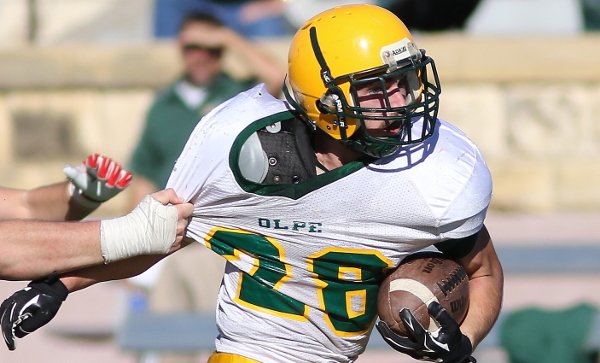 Olpe committed four turnovers last week against Oswego, something they’ll have to clean up to beat the Tigers. Meade has churned out one of the state’s best offenses with 427 yards per game, including 325 on the ground. On paper, this trip to Marion is easily the Buffs’ toughest regular season matchup. The Buffaloes have outscored their opponents 312-52 and their closest game was a 35-18 Week 4 home victory versus Cimarron. Meade easily ranks No. 1 in the classification in both offense and defense with a 312-52 total margin. Junior Lawson Luetters has completed 34 of 50 passes for 732 yards with 13 touchdowns and just one interception. He also leads the team with 72 rushes for 701 yards and 10 scores. Senior Dakota Messer has 14 catches for 397 yards and eight scores. Seniors Delrey Welsh and Kash Larrabee pace the defense with 94 tackles and 14.5 TFLs combined. Last season, Meade hung on for a last-second 39-36 home victory over the Warriors. Marion typically plays in low-scoring contests and relies on its defense, and that’s been the case again this fall. The Warriors have permitted just 118 points, which is tied for 11th in the classification. Marion has scored 172 points after a 9-2 season last fall. The Warriors dropped out of the top-5 this week after a 34-24 upset, home loss to Northern Heights. Marion lost a 24-14 halftime lead. The previous week, Marion needed a fourth quarter score to top struggling Chase County 14-13 after the Warriors put together an impressive opening month. Quarterback Jack Schneider leads the offense, while Aaron Riggs has been solid in the backfield. Meade hasn’t posted a perfect regular season since 2011. That includes regular-season losses to Canadian (Texas) and Holcomb to open the 2010 and 2012 seasons, which eventually resulted in a 2-1A state title. This has the makings of an upset, though Luetters’ ability to run and throw proves to be too much. The District 1 championship will likely be decided in Axtell on Friday as 8M-II No. 5 Pike Valley comes in to take on the Eagles. Both the Panthers and Eagles enter the contest 5-1 on the season and 2-0 in district play. Axtell dropped a Week 1 showdown with Hanover, 48-22, while Pike Valley fell to Mankato-Rock Hills, 34-28 in Week 2. For what it’s worth, Hanover (6-0) later defeated Rock Hills (5-1), 50-16. Axtell’s all-state senior quarterback Colton Buessing was injured in the Eagles Week 3 win over Pawnee City (Neb.). He has yet to play since that game, and his status remains unknown for this week. He passed for 2,032 yards, 26 touchdowns, and rushed for 626 yards and 17 scores last season as Axtell reached the state semifinals. Sophomore Kaleb Buessing has stepped in at quarterback and passed for 443 yards and four touchdowns, while completing an incredible 79 percent of his passes. He’s added 396 rushing yards and ten touchdowns to lead the team. His touchdown with 8 seconds remaining helped lift the Eagles to a 30-24 district victory over Frankfort in Week 5. Brice Koch leads the Eagles with 20 receptions for 345 yards and five scores. Adam Kuckelman has ten catches for 246 yards and two touchdowns, while Caleb Heiman has 15 catches for 104 yards. Pike Valley had high expectations entering 2015 with five returning starters from last year’s state quarterfinal team. The Panthers lost their first four games a season ago, then won four of their next five to reach the playoffs. Pike Valley beat Chase 58-34 in the first round before falling to Argonia-Attica, 56-32. The Panther offense is led by a pair of sophomores in running back Lane Peters and quarterback Davante Hammer. Peters has already rushed for 1,163 yards and 19 touchdowns this season. He earned Kpreps All-District honors as a freshman a season ago when he rushed for nearly 800 yards and 13 touchdowns. Peters carried 35 times for 428 yards and seven touchdowns in last week’s wild, 74-50 win over Frankfort. The Panthers and Wildcats were tied 50-50 entering the fourth quarter before Pike Valley pulled away. Hammer has completed 65 percent of his passes for 381 yards and seven scores this season. With Colton Buessing’s status still uncertain, a slight edge goes to the visiting Panthers. Logan-Palco (6-0) at Atwood-Rawlins Co. (4-2) – Atwood-Rawlins Co.